Check out the new features in AutoCAD Electrical 2016 in the 2 videos below, the second one shows the then electro-mechanical workflow with Autodesk Inventor. 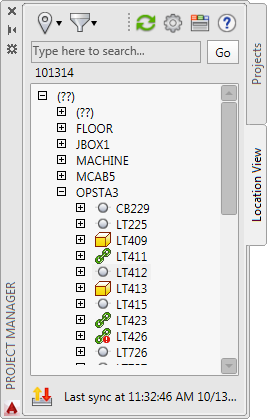 The new Location View tab on Project Manager provides a complete view of the devices and wiring contained in the active project. Components are organized by installation and location values. Hover over a device to view catalog, description, and rating information. Expand the device to view the component pin values. Filter the list based on installation and location values. Refresh the view to reflect changes across the project. Locate a device in the list by entering a search string. Right-click to surf to a selected component. Display the Details pane to view component details and the Connections pane to view wiring from\to information. Export the data shown in the Details or Connections pane to a .csv or .xls file. You can now link an AutoCAD Electrical project to an Inventor project. The link provides data exchange between your 2D and 3D electrical designs. Once your project is linked, use the Location View tab to view both the AutoCAD Electrical and Inventor components and data. Insert from Catalog Browser. Performs a catalog lookup, using the catalog information from the Inventor part, where you can insert a symbol to link to the Inventor part. Link to Existing in Drawing. Select a symbol from the drawing to link to the Inventor part. Filter the view by link status. Refresh the data from Inventor. Use the Details and Connections pane to view differences between the linked components. Use the Accept Peer button to reconcile the differences between the linked components. This same functionality is available in Inventor from the new Electromechanical tab on the Assembly ribbon. Note: This was an idea from the AutoCAD Electrical IdeaStation. The drawing and project property for sort order now applies to wire sequence as well as tag and wire number order. This setting provides default wire sequencing for wire networks with multiple components. Check for a wire sequence defined using the Edit Wire Sequence command, including any Direct-to-Terminal connections. Check for angled tees on the wire network. Check if any of the components have the same Location. Use the Sort order drawing property to determine the connections for anything not accounted for in the previous checks. 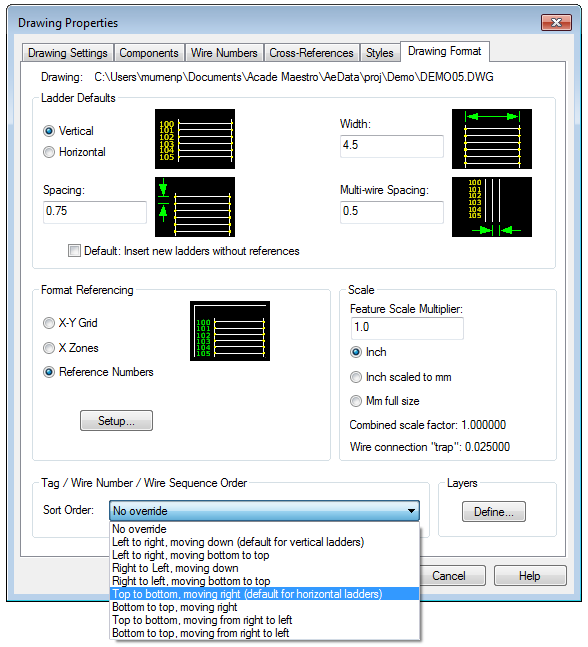 The Insert Connector dialog box settings are maintained across sessions of AutoCAD Electrical. Once you set your default settings, you do not have to set them again. The product supports two groups of settings, one for metric drawings and another for imperial drawings. The appropriate settings are used automatically based on the active drawing. When working on a one-line diagram you may want to annotate a one-line component based on a schematic or panel component already inserted. To make it easier, a new option is available to filter the list of components based on whether there is already a matching one-line symbol. Select this check box to include all schematic, panel, and one-line references where there is a matching one-line component for either a schematic component or a panel footprint. Note: The one-line reference is only included if the Show one-line components box is also checked. 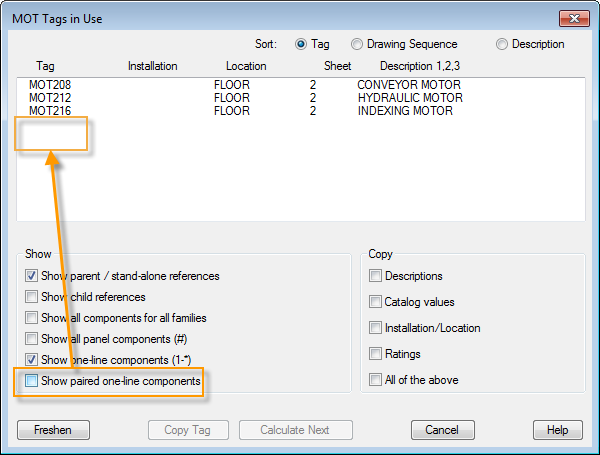 Clear this check box to filter out all schematic, panel, and one-line references where there is a matching one-line component for either a schematic component or a panel footprint. The resulting list contains only tags that do not have matching one-line components. 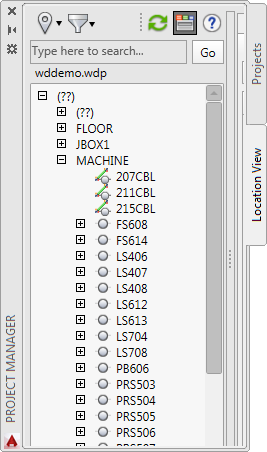 If you insert schematic terminals using the Multiple Insert commands, there are now options to hide the tagstrip, installation, and location attribute values. When using Multiple Insert (Icon Menu) the options are available after the first terminal is inserted. When using Multiple Insert (Pick Master), the options are available for each terminal inserted, including the first one. Child components linked directly to the parent with the dashed link line are filtered out of the cross-referencing on the parent component. Buttons for rating defaults added to the View / Edit Rating Values dialog box when editing a panel component. Each button opens the Ratings default file so you can select a value to assign to the attribute. 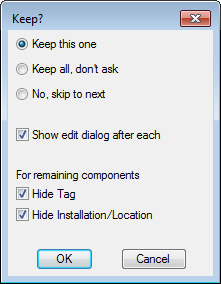 The Insert\Edit Component dialog box opens when you insert a parametric connector so you can further annotate the connector. The Copy Circuit command defaults to selecting multiple insertion points for creating multiple copies on the same drawing. A new Circuit Builder API is available to link components within a circuit with a dashed link line. The Export to Spreadsheet now freshens the database automatically before performing the export. A new check box on Terminal Strip Editor lets you save the internal and external device assignments.